"This is one of the greatest stories underway on the planet—the effort to wrest vast quantities of the dirtiest energy on earth from beneath Canada's boreal forests, and the even greater and far more beautiful effort to stop them. The stakes—the health of the planet's climate—simply couldn't be higher. Read this book. Extract does a great job of giving voice to some of the people on the front lines and giving you the information you need to engage in the debate." 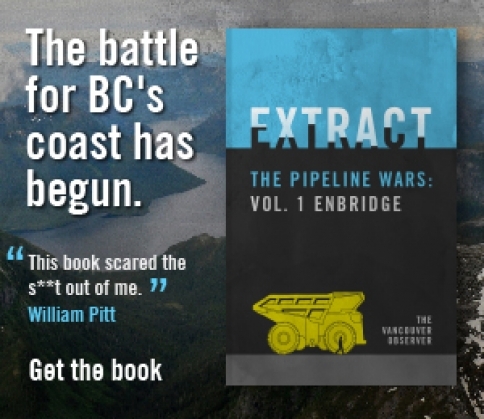 Extract: The Pipeline Wars is a terrifying tour-de-force that opens a grim window on the future: this is not just about British Columbia, but about the world. As the fossil fuel industry taps dirtier and dirtier sources of energy to maintain their supremacy, as more regions of the world are despoiled in the process, the downhill run to ultimate destruction lies plainly before us...unless it can be stopped. Extract: The Pipeline Wars tells us why, and how, this must happen. Excellent, important work. — William Pitt, Truthout editor and New York Times bestselling author. We need information and hard facts to make thoughtful, forward-thinking decisions that reverberate long into the future. Here’s a book that cuts through the self-interested rhetoric of climate deniers and the fossil fuel industry.